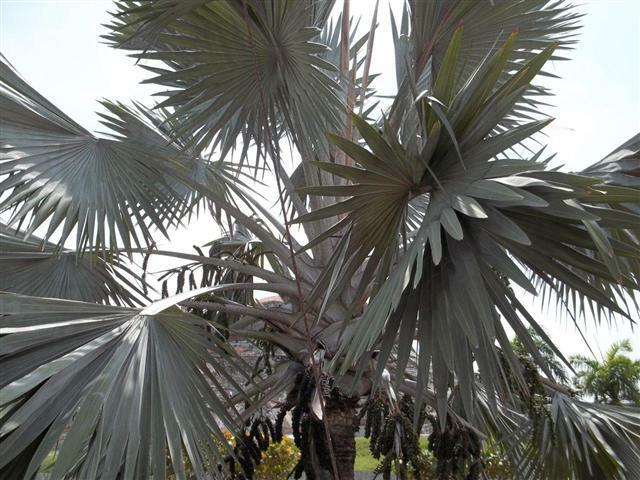 Bismarckia nobilis is a stunning, large silver blue fan palm that has become increasingly more popular in the past ten to twenty years. It is native to Madagascar where it tolerates fairly dry and hot climates. There is only one species within this genus. It is a stately single trunk palm that has a good sized trunk and, over many decades, can get tall. First introduced into the commercial nursery market about twenty years ago, it is being used both commercially and in the home garden in increasing frequency. 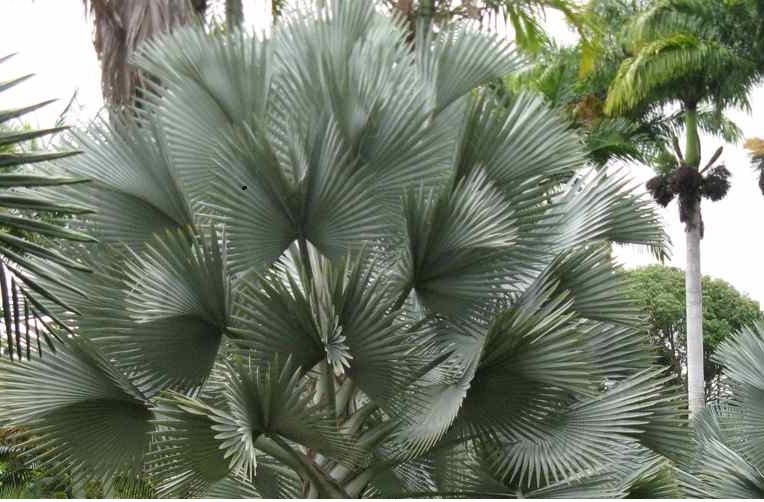 It is commonly called the Bismarck Palm. Either as a single specimen or in groups, this is a strikingly beautiful species. It is most commonly known for its silver blue color. 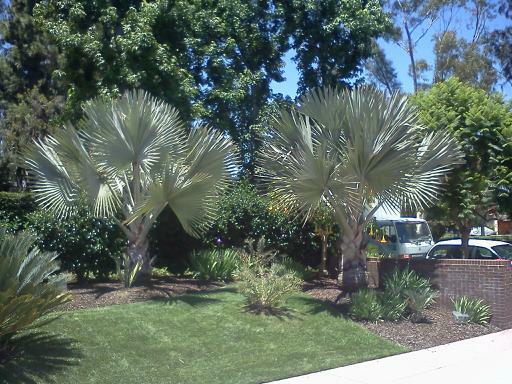 Remember that most gardeners and enthusiasts love blue palm trees. Juvenile Bismarck Palm in HI, photo by T.B.. Although mentioned in the literature for many decades, this species has become much more understood over the past twenty years. It is from the western and northern areas of the country of Madagascar where it enjoys sun, heat and dry conditions. It was named after the German chancellor, Prince Otto von Bismarck, who lived during the 19th century. As mentioned in his book, the Palms of Madagascar, John Dransfield points out that this is one of the few palms named after a politician. Bismarckia nobilis is similar to another genus, Medemia, but the two are felt presently to be two distinct genera. It is a common palm in Madagascar, but surprisingly wasn't really utilized in landscapes elsewhere in the world until recently. There are some isolated specimens in botanical gardens outside of Madagascar that were introduced many years ago, but it's popularity has exploded in the past two decades. This palm is natively found only in Madagascar. There it is seen almost entirely in the western side of this large island and is often found in very harsh natural conditions. It is fairly common in habitat and is widespread over many localities. 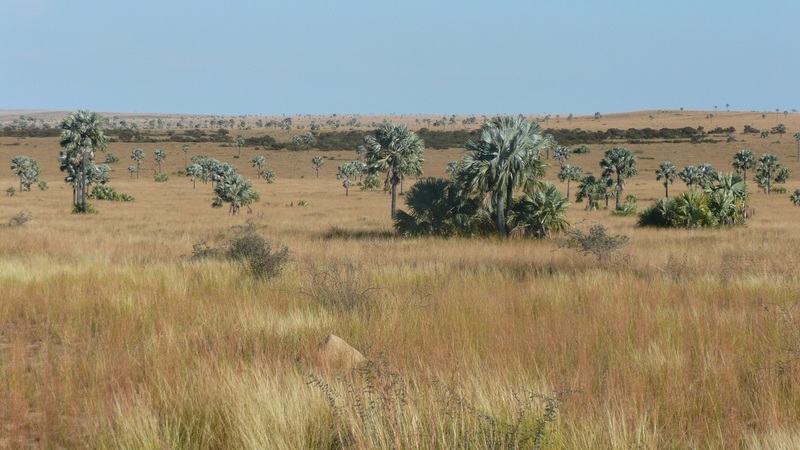 It is seen in plateaus and plain areas where it experiences extremes in weather from very hot and dry to more humid conditions during the rainy season. 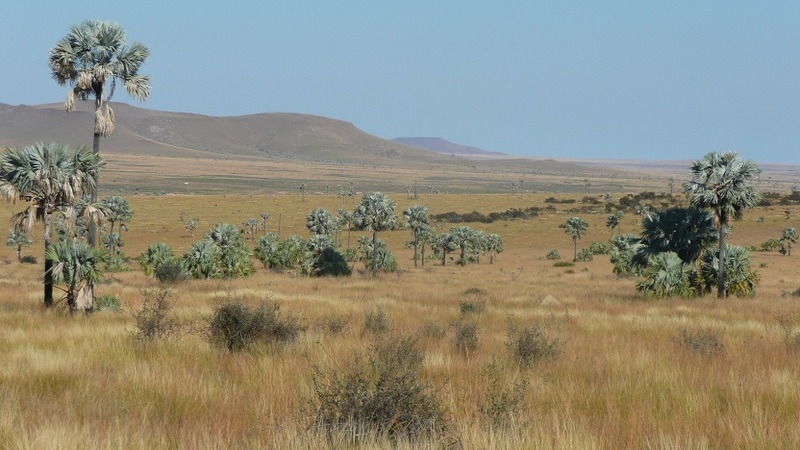 From a cultural point of view, this species has been found to thrive in more tropical and humid environments around the world but has also had success in drier, desert areas. So, it tolerates a wide variety of conditions. Also, in habitat, is endures fires probably because the crown of leaves is well above any brush fires. 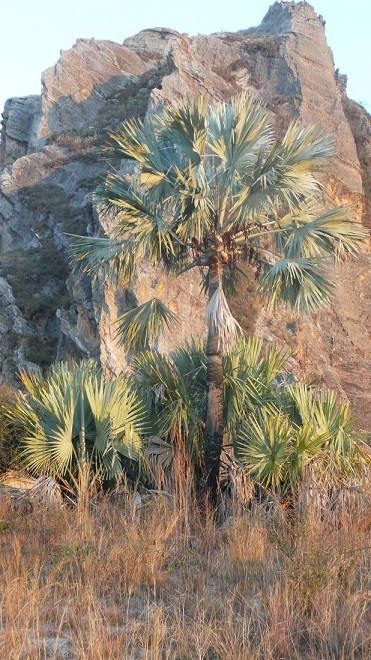 In many areas in Madagascar, it is the only palm species evident. Native habitat, photo by M.R. Near stone outcropping, photo by M.R. 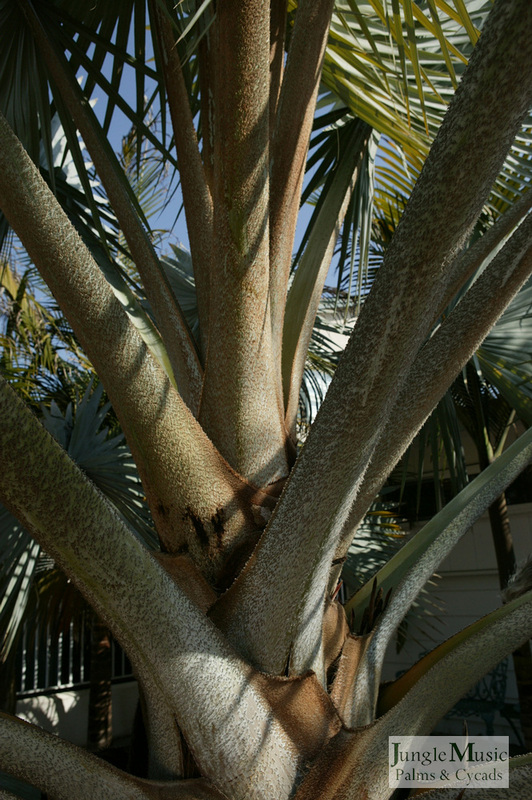 Trunk: Bismarckia nobilis is a single trunk fan palm. It's trunk diameter is typically 18 to 24 inches. This palm in habitat is known to get up to 60 feet, but this height may take a century to reach. The trunk is straight, a tan or brown color and basically smooth with hints of old scars from leaf bases. It has no crown shaft. The base of the trunk may be swollen. Leaves: The crown of leaves numbers from 15 to 30 leaves, typically blue to silver in color, and slightly arched. Of note, there are both green and blue forms of this species (described below). Leaves fall off easily when old and there is essentially no petticoat of old dead leaves as seen with some other species. The leaf width is 8 to 10 feet with approximately 20-30 divisions. The overall crown width is approximately 20 feet. The petiole length is 6 to 8 feet on mature specimens. On the blue variety of this species, the leaves have a silver-blue waxy coat. The leaf stems and bases may be smooth or hairy. Plants without the hairs almost have a polished metal feel to the stems. This causes such stems to be intensely blue. It is unclear why the hairs are variable among different populations of this species. But, if you look at a lot of Bismarckia, you will note stems from polished and smooth to very hairy and bumpy. Blossoms and Fruit: Bismarckia is a dioecious genus. This means there are male and female individual plants. To form fertile seeds, female flowers must be pollinated by pollen from a male plant. This is usually accomplished by insects, but can be done by wind and proximity as well. Mature fruits formed are dark brown to black in color and round. They are approximately 1.5 inches long. Bismarckia female in fruit, Columbia SA, photo by T.F. Same plant, close up view, photo by T.F. Since Bismarckia Palms were introduced commercially, it has been known that there is a blue and a green form. Because of the popularity of the silver blue form, few green Bismarckia are seen in landscapes. There also seems to be less cold tolerance with the green form, a fact that is surprising. And, to make things a bit more complicated, there seems to be "really blue" plants and "in-betweeners" in color. Therefore, a wise consumer who wants a very blue plant should look carefully at the color of the purchased plant. Select the plant with the most satisfying color. There is another issue of a red discoloration to the leaves. Sometimes this is purple or similar shades. It is usually seen on smaller or juvenile plants. It appears that this color is a result of exposure to cold weather. This purple color is typically seen with the blue variety and may disappear with age and size. Bismarckia, green variety, photo by T.B. Bismarckia nobilis is a good grower. It likes full sun, sandy soil, good drainage and heat. In areas where summer rain is prevalent, it seems to put on rapid growth with this ample water. In areas where most of the rainfall is during the cooler period (Southern California), the growth of Bismarckia is slower. Therefore, little supplemental water is needed during the winter. In California along the coast, full sun is preferable. In inland areas it can be grown in half day sun. Good drainage is also important, especially if you have a cooler rainy period. This is a species that does not want to sit in continually wet, mucky soil. 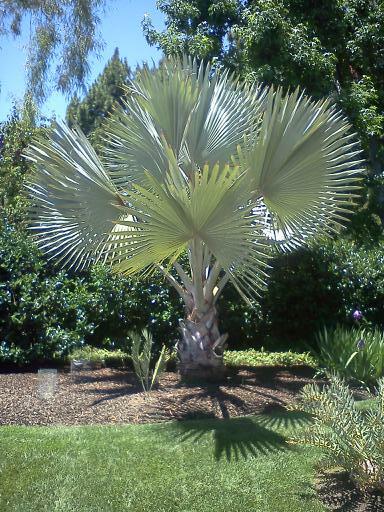 Although the Bismarck Palm can tolerate drought, it does respond to ample water during the summer and gives more rapid growth. Since introduction to the commercial market, it has been found that this species performs fabulously in tropical and subtropical climates like Hawaii and South Florida. It also grows well in Southern California and some Californian and Arizona desert climates. I would classify its growth rate as medium. An average 15g palm can get up to eight feet height in about 3 years in the ground. Growth is much slower in containers. If growing in a container, as you would expect, it likes a big pot with plenty of room for root growth. The cold tolerance of Bismarckia seems to be the low 20's F. I personally know of many specimens that have survived 22 degrees and even a bit lower. At the opposite end of the spectrum, it has no problem with heat to 110 degrees F. Common things that can kill a Bismarckia include poor drainage, too much water (especially during cold weather), too low of temperatures, too dark of growth environment, and significant disturbance of the roots. This species seems to be more susceptible to poor culture than to insect infestations. Root burn from fertilizers is something one wants to avoid. To summarize on basic culture, consider this species if you have good draining soil, experience ample heat during the year and down get below about 22 degrees. 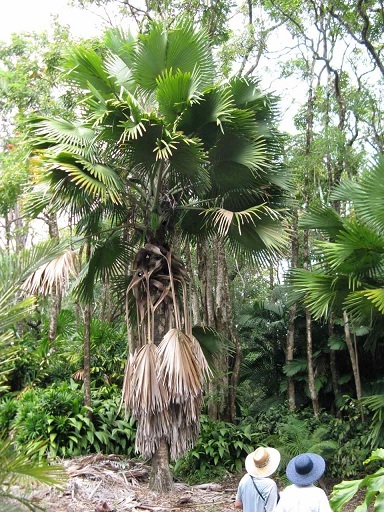 When one looks at pictures of Bismarckia nobilis in habitat in Madagascar, he begins to realize just how hardy this palm is and the extremes of conditions it tolerates. The picture to the left below shows how someone has planted young Bismarckia along a driveway in Madagascar. To the right you see the dry conditions where Bismarckia nobilis grows natively. and dry. Photo by M.R. Special mention should be made about the disturbance of or damage to the roots of a Bismarckia Palm. They are very sensitive and significant damage can kill a plant or put it into serious decline. What this means to you is that a good sized specimen is extremely difficult to successfully dig and transplant to another location. Also, a purchased plant in a container that has "rooted" into the ground may succumb if the roots out of the bottom holes are torn while lifting the plant. Also, when transplanting from one pot to another, rough handling of the roots can cause decline. We have seen over the years how imported Bismarckia that had their roots pruned prior to transport to California uniformly went into decline with leaves turning dry brown. And, many died about two weeks after arrival. So, be ever so careful with the roots of this species. Bismarckia seeds fall off the tree with dark fruit. This fruit must be removed prior to attempts at germination. Wash the seeds thoroughly to remove this fruit and plant seeds at with the upper 1/3 to 1/2 of the seed showing above the mix. We advise using a good draining mix such as perlite and peat moss, but many utilize sand mixes. Typical watering schedules are two to three times a week on this open mix. Bottom heat may speed germination in colder areas. But, be careful that the large roots near the container's bottom don't "cook" from too much heat. Germination typically takes one to three months. When germination occurs, a very deep radicle root is produced even prior to the formation of the first leaf. Because of this, it is best to germinate seeds in a deep container to give the roots enough room. When separating new seedlings, be quit gentle with the roots and do not break any roots. This can cause a rapid death to the seedling. In its new pot, once again give the plant plenty of root room. 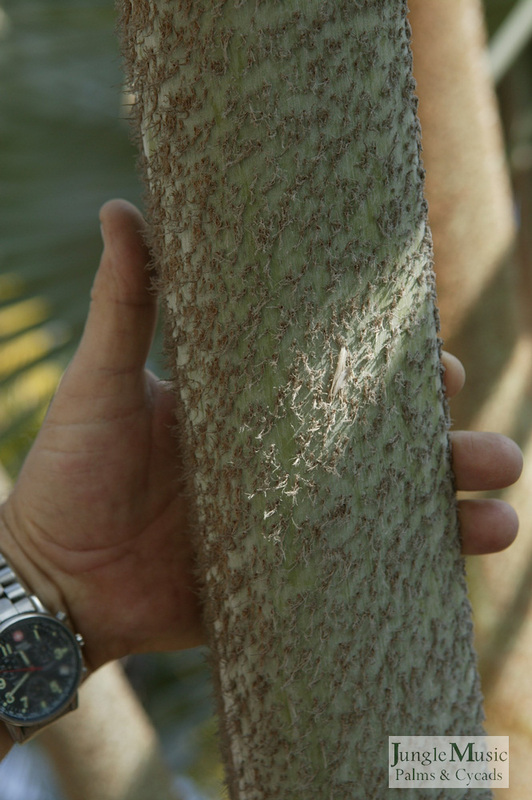 Many people in colder areas would like to grow the Bismarck Palm. This way they can bring the plant inside during the winter. As mentioned, this palm tolerates low temperatures down to about 22 degrees, perhaps a bit lower. For enthusiasts that have lower temperatures than this, they must winter their Bismarckia in a greenhouse or inside the home. I have little data on the growth of this species inside the house. However, if you do attempt this, give it plenty of sun inside and do not overwater it. It should also be reiterated that containerized Bismarcks do not grow nearly as fast as they would in the ground. This species would probably not be recommended as a "year round" interior plant. 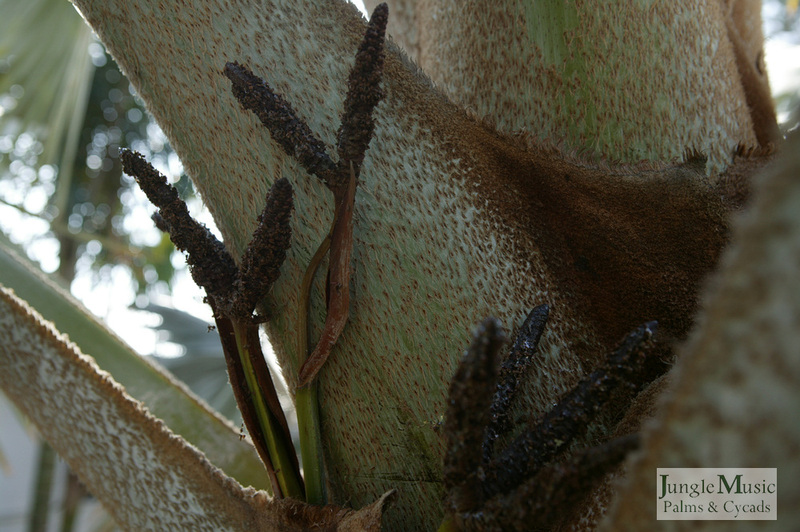 To the untrained eye, Brahea armata (the Mexican Fan Palm) and Bismarckia nobilis are similar. Yes, there are similarities. Both are blue fan palms, single trunk, and like hot dry conditions. But, there are many differences. First, they come from opposite sides of the planet. 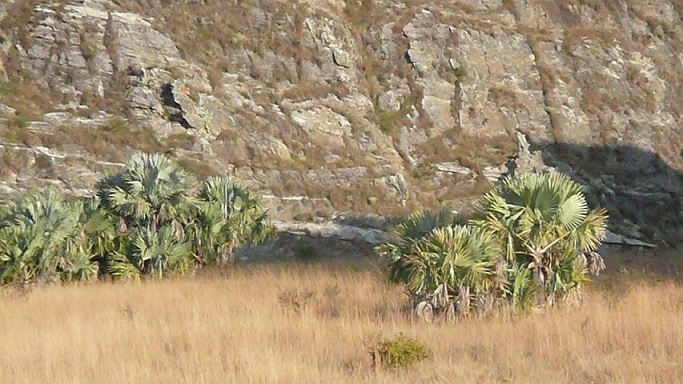 Brahea armata comes from Mexico, Bismarckia from Madagascar. Bismarckia is a monotypic species with only one species in the genus. There are many different types of Brahea. Bismarckia are much faster growing and eventually get much taller. Crown size could be said to be similar, but Bismarckia has larger leaves. Bismarckia seeds are much larger than the very small B. armata seeds. Not to forget the taxonomists, the blossoms are totally different. 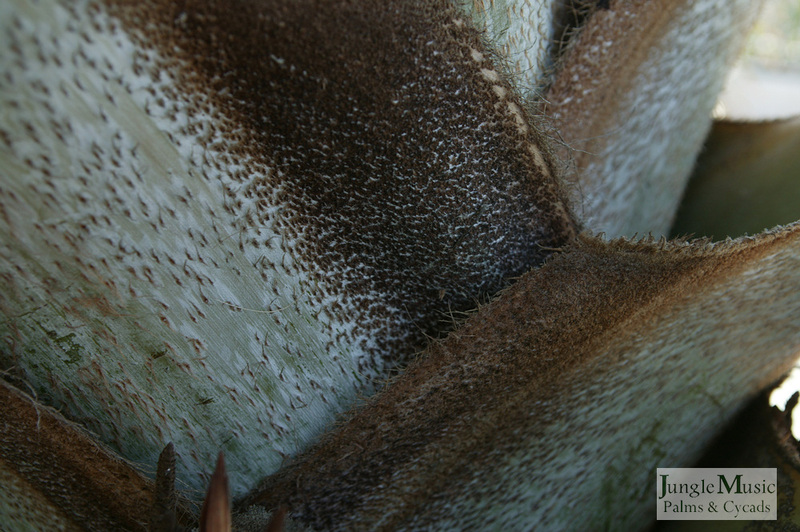 Brahea armata is more cold tolerant than Bismarckia, taking temperatures to about 15 degrees. 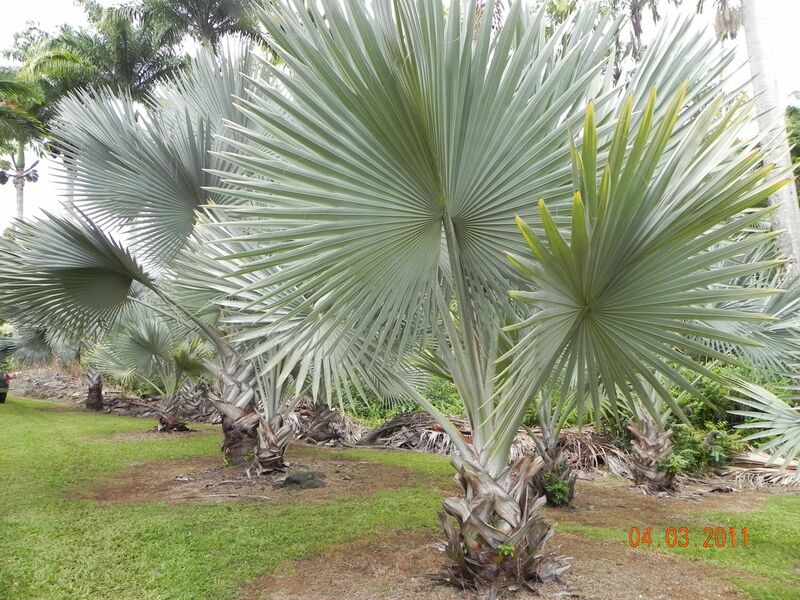 Bismarckia also grow in tropical climates whereas the Mexican Blue Fan has more difficulties because of the humidity. And, there remains one final huge difference: by survey, most people think that Bismarckia is much more beautiful when it is mature. This is, of course, up to the eye of the beholder, but seems to be a common viewpoint. 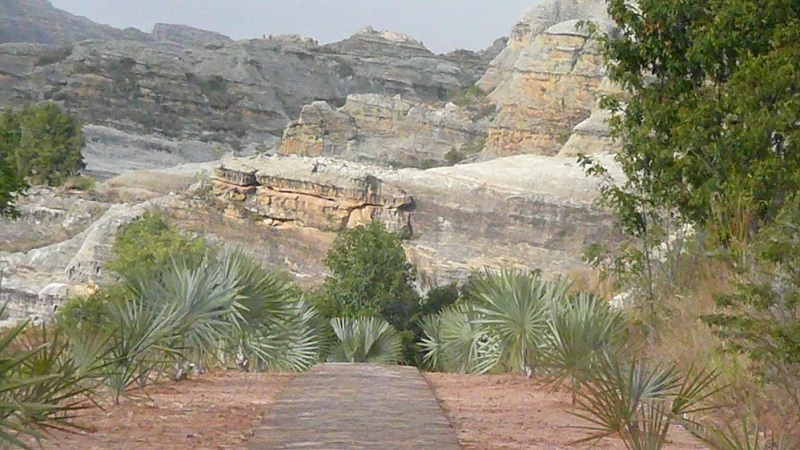 If you really want a blue fan palm but live in a very cold area, Brahea armata might be a good substitute palm species. Populations of Bismarckia nobilis in the wild historically have not been included in the endangered species list as they have been plentiful in their native habitat. In the past two decades literally tens of thousands of this species have been planted in many domestic and public habitats worldwide. It has been found that such plantings are presently fruiting with viable seeds. This will undoubtedly take the stress off of collection of wild habitat seeds and plants. It is not unusual for botanical gardens to feature a planting of multiple silver blue Bismarckia. When the enthusiast can give an environment of heat, full sun, and no temperatures below approximately 22 degrees F, the Bismarck palm becomes an ideal addition to the garden. It is great for both commercial and domestic gardens. Like many larger palms, it looks its best when given plenty of room for both growth and viewing. When exposed to travelers coming by the garden, it is not unusual for people to stop their car and admire the Bismarckia. If properly selected for color, the Bismarck will show the most wonderful color of silver-blue one can imagine. Do not plant it close to a building or structure. And, do no plant it where it might get shaded out by adjacent trees. Remember, this is a very difficult palm to relocate once established if you later decide you put it in the wrong spot. If given adequate space between trees, a group of two or three specimens is very attractive. Perhaps you might be lucky enough to get both a male and female and some day have viable seeds. 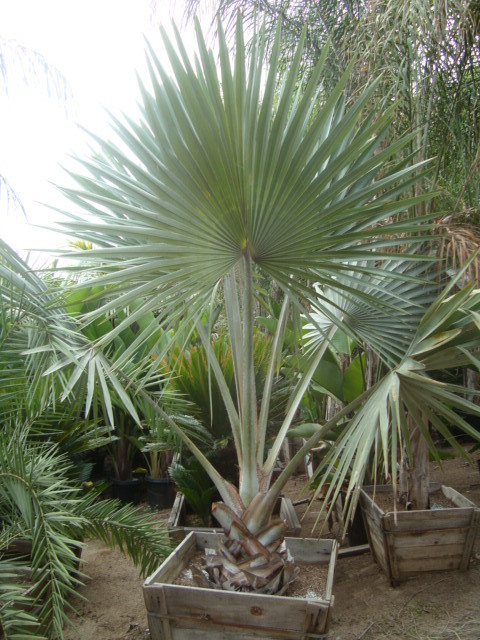 Bismarckia is a gorgeous and typically blue single trunk fan palm that has become very popular. It likes sun, heat and good draining soil. It tolerates cold temperatures into the low 20's F. It is ideal for domestic and commercial planting and is a "showstopper". 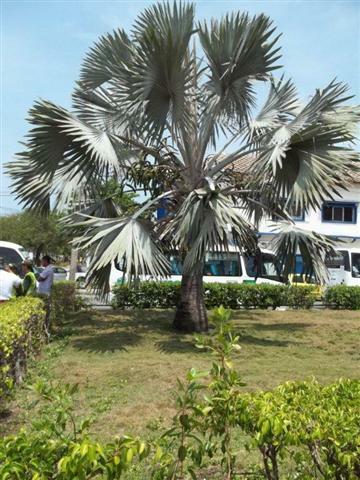 It is not unusual for someone driving by to observe your large Bismarckia and ask you "hey Mister, what is that gorgeous blue palm?". It grows at a medium speed and looks best if given some room. It is stately and magnificent in its appearance. Mention is made of the rare green form of this species and how one must take care not to damage Bismarckia roots. It is good for tropical, subtropical and Mediterranean climates where temperatures don't get too cold. Culture in containers is possible although growth rates are slower. As a reminder, Jungle Music has a variety of sizes of Bismarckia nobilis for sale, from small to large. We can ship plants anywhere within the United States. Bismarckia habitat, photo by M.R. We have lots of Bismarckias of various sizes for sale at the nursery. 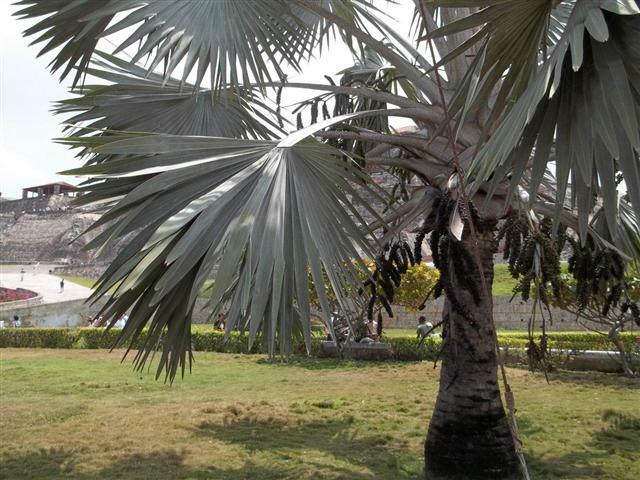 For other articles on palm trees, click here.